Reworks and Remixes of our back catalogue classics adorn the web - testament to the firm foundations upon which we have built our labels. 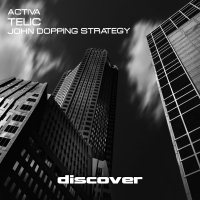 However only the very best get an official release and John Doppings Strategy Remix is up there with the very best. A true remix in every sense of the word, Dopping has maintained the integrity of the original whilst approaching it without fear to give it his own unique makeover. We have been huge fans of John Doppings work since the very beginning and this was further cemented when we heard his debut artist album "Words in Colour" - an album which we will be proud to give it's first full unedited release in June. In the meantime, this Telic remix stands as a fine example of John Dopping's production skills and creative flair.